Hire Us to Deliver Your Message! Quite simply, no other London-headquartered professional communications firm comes close to what partners JeffreyReedReporting.com, LondonOntarioSports.com and LondonOntarioGolf.com can offer you. A member of the local media since 1980, one of Canada’s leading freelance communicators and a media and community relations specialist since 1989, Jeffrey Reed is London’s most diversified and knowledgeable communications professional. A seven-time national and international award winner for journalism and public relations excellence, Reed combines writing, social media platforms, broadcasting/public speaking, teaching and photography skills like no other London-based communications specialist. And with three partnering companies offering you a diverse range of services – all at custom and affordable prices – your business or not-for-profit endeavour will benefit greatly from Reed’s expertise. Whether you need company literature for internal or external communications, a master of ceremonies or after-dinner speaker for your special event, or any other professional communications service, Jeffrey Reed will be an invaluable member of your team. Jeffrey Reed has captured six national and international writing awards for sports journalism over the past decade. In addition, he has worked hand-in-hand with large international companies including 3M Canada. And, he helped Doug Tarry Homes of St. Thomas capture a Canadian Home Builders’ Association Grand SAM Award with his writing about the Lake Margaret community for a Doug Tarry Homes customer brochure. Reed wrote Sifton Properties’ 90th Anniversary booklet, and the 50th Anniversary booklet for Steeves & Rozema. He’s a three-time author, too, who has penned: EBBA 40 Years of Baseball (1994) – London’s first baseball history book; Building Distinction: 100 Years of Construction in London (1998) for the London & District Construction Association (LDCA); almost single-handedly wrote the LDCA’s annual publication for a quarter of a century; and in spring 2018 completed a two-year project – the 100th Anniversary book for the prestigious Canadian Seniors’ Golf Association. Jeffrey Reed has been the play-by-play voice of the London Knights of the Ontario Hockey League, and the Vanier Cup-winning Western Mustangs, just to name a few teams. He has produced, written and hosted numerous radio and television shows, including the popular Sports Rap and Forest City Fairways weekly shows for local radio and Rogers Television. Reed has acted as master of ceremonies for a wide variety of special events, including charity golf tournaments, the Intercounty Baseball League’s London Majors and Canada’s national baseball program at all-star events. He has even assisted in securing talent and hosting internationally-recognized music events, working with such superstar artists as Blake Shelton and Michelle Wright. Local Sports Associations: Let Us Write Your Media Releases! Have a special event or tournament? Want your association to receive coverage in the local media? Let LondonOntarioSports.com write and distribute your media releases. Publisher & Editor Jeffrey Reed is a leading-Canadian media relations professional who, in 1994, founded and operated the media relations office for the Intercounty Baseball League. Reed has also written and distributed media releases for numerous high-profile sports groups, including the Freedom 55 Financial Championship, the season-ending tournament for the Mackenzie TOUR PGA Tour Canada. Since 1980, Reed has worked with almost every local minor sports association, and has even written the history book for the Eager Beaver Baseball Association – read about it here. Our rates are very reasonable and custom priced – get in touch and see results! Both Western University and Fanshawe College of Applied Arts & Technology have leaned on Jeffrey Reed’s expertise in the classroom where he taught as an adult education instruction and post-graduate program professor. The International Association of Business Communicators, and London Association of Volunteer Administration have both hired Reed to deliver information seminars. Whether your business, group or association needs a lunch-and-learn seminar, a keynote speaker or a mentor/coach, Jeffrey Reed can you help you achieve your goals. Jeffrey Reed’s photography has graced the covers of numerous newspaper and magazines across Canada and the U.S. The Detroit Tigers have hired Reed to photograph their minor league prospects. He has taken photos at Major League Baseball, PGA Tour and LPGA Tour contests, at NHL rinks and at endless local sporting events including London Knights and Western Mustangs games. Local realtors, automotive dealerships and construction firms hire Reed for their portraits, promotional photos and progress photos. In addition, if you need assistance with the planning of a special event, and wish to hire a professional to deliver your message via social media during your event, then Jeffrey Reed can put an affordable package together for you. 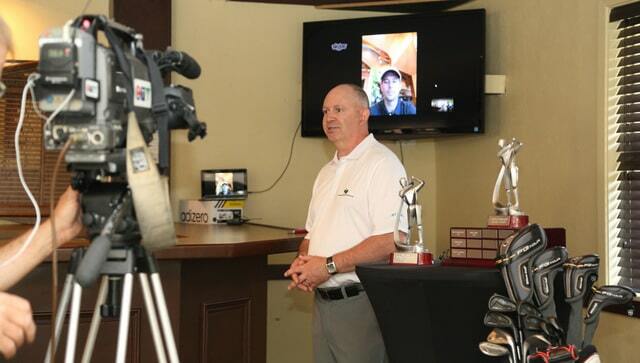 For more information on JeffreyReedReporting.com, LondonOntarioSports.com and LondonOntarioGolf.com professional communications, and for photography and writing examples, please visit here. To read our testimonials, please visit here. 519/643-6334 or news@londonontariosports.com to speak with us about how we can help you deliver a professional, effective message! London Ontario Sports now provides you with numerous advertisement locations throughout our website – starting at just $199 plus HST for six months at the Partners page. Higher-profile locations throughout the site are priced on a six- and 12-month basis, and start at just $299 plus HST. London Ontario Sports is a sister publication of London Ontario Golf – the Voice of Golf in Southwestern Ontario! London Ontario Sports is already an involved member of the community – read about us here. London Ontario Sports is not responsible for legal responsibilities of our advertisers. We reserve the right to choose our advertisers. Visit The Bluffs Golf Club in Port Stanley online here.